Her Royal Highness Maha Chakri Sirindhorn of Thailand is a princess with a passion for science, development and education. The daughter of King Bhumibol the Great, who reigned for more than 70 years over the Southeast Asian nation—and the younger sister of the present monarch, King Maha Vajiralongkorn, who acceded the throne in 2017—the Princess Royal is no newcomer to fusion: along with leaders of Thailand's science and technology agencies she has visited fusion installations at Lawrence Livermore National Laboratory in the US and the EAST Tokamak in China, toured the Jülich research centre in Germany, and presided at the handing over of the HT-6M tokamak that China recently donated to the Thailand Institute of Nuclear Technology. The Princess Royal clearly supports fusion as an option for a major contribution to the future world energy supply. Accompanied by a large party of scientists, diplomats and high-level officials, she recently honoured ITER with a half-day visit. 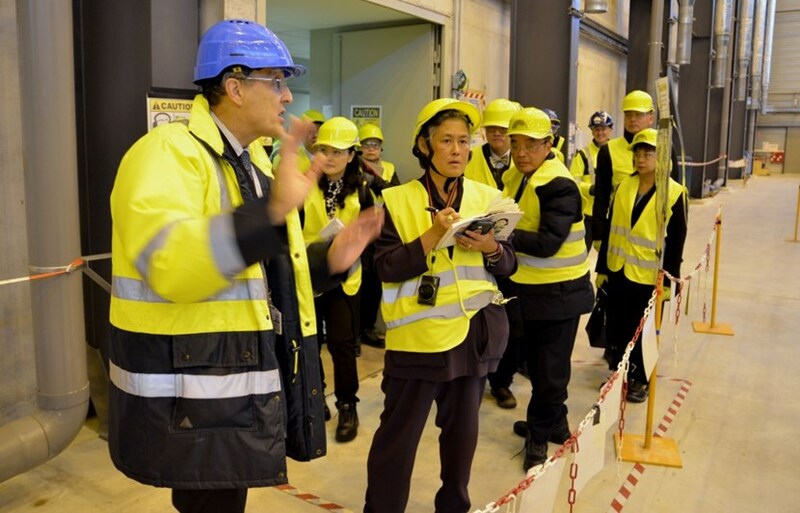 Her interest in fusion and in fusion's flagship ITER was obvious: throughout her visit to the Cryostat Workshop (photo above), the Assembly Hall, the cryoplant, the Tokamak Building and the virtual reality room, the Princess Royal carefully wrote the highlights of Director-General Bigot's explanations on a notepad, took pictures with her small camera, and inquired about the technical details of fusion and societal perspectives. She told Bernard Bigot that her father, more than 30 years ago, had stressed to her that the world energy future would need nuclear power and already mentioned fusion energy as a promising option. The visit of the Princess Royal and her party was also the occasion to witness the signature of a Cooperation Agreement between the ITER Organization and the Thailand Institute of Nuclear Technology (TINT), represented by its Executive Director Pornthep Nisamaneephong (photo above). The Agreement aims to promote the public understanding and acceptance of fusion energy. It will provide courses and lectures to young students and scientists in Thailand and facilitate visits to ITER by TINT scientists, young experts and students.